All frogs are assumed to jump in a similar manner by rapidly extending hindlimbs during the propulsive phase and rotating the limbs forward during flight in order to land forelimbs first. However, studies of jumping behavior are lacking in the most primitive living frogs of the family Leiopelmatidae. These semi-aquatic or terrestrial anurans retain a suite of plesiomorphic morphological features and are unique in using an asynchronous (trot-like) rather than synchronous “frog-kick” swimming gait of other frogs. We compared jumping behavior in leiopelmatids to more derived frogs and found that leiopelmatids maintain extended hindlimbs throughout flight and landing phases and do not land on adducted forelimbs. These “belly-flop” landings limit the ability for repeated jumps and are consistent with a riparian origin of jumping in frogs. 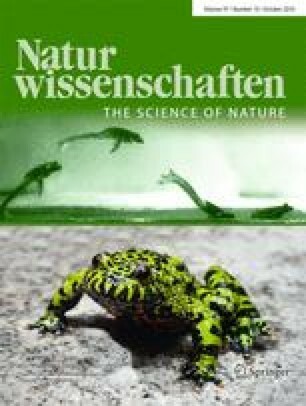 The unique behavior of leiopelmatids shows that frogs evolved jumping before they perfected landing. Moreover, an inability to rapidly cycle the limbs may provide a functional explanation for the absence of synchronous swimming in leiopelmatids. The online version of this article (doi: 10.1007/s00114-010-0697-4) contains supplementary material, which is available to authorized users. We thank Paul Brunkow, Mike Jorgensen, Sandra Nauwelaerts, Mike Paulin, James Robins, and John Scheibe for their comments and assistance. The Idaho Department of Fish and Game and United States Forest Service provided collecting permits. This work was supported by a Summer Research Fellowship and a Funded University Research grant from Southern Illinois University Edwardsville to RLE and an Ohio University Research Challenge grant to SMR. The following landmarks were digitized: snout, occiput, urosacrum, shoulder, elbow, wrist, hip, knee, ankle, and tarsometatarsus. Jump distance was measured as the difference in position of the snout from the beginning of movement to the end of forward progress. Knee angle was measured as the angle formed by the hip, knee, and ankle. Ankle angle was measured as the angle formed by the knee, ankle, and tarsometarsus. Landing body attack angle was measured as the angle formed by the snout, urosacrum, and horizontal. Elbow angle was measured as the angle formed by the shoulder, elbow, and wrist. Forelimb protraction angle was measured as the angle formed by the wrist, occiput, and urosacrum.